The client is a South African FSB regulated hedge fund composed by a team of 6 traders and managing around 50 to 100 million $ AUM. The client is looking for a trading platform which will allow them to trade spot Forex primarily. They will perform discretionary manual trading as a start, then automated trading later. So the platform will ultimately need to accommodate both trading style. The client has a Prime Broker account with a Tier-I bank. All traders share the same account. The client has already a relationship with one liquidity provider (a Forex venue) but is looking to extend progressively the number of liquidity providers: execution venues and banks. So the solution must be scalable in term of liquidity connectivity and aggregation needs to be available. The trading platform needs to allow Spot Forex trading. If possible, account and position must be get from the client Prime Broker. Manual trading should be possible on the platform. Automated trading should be possible on the platform. The solution should accommodate a multi-traders environment, allowing scalability. The liquidity provider connectivity needs to be scalable with aggregation functionality. The deployment of the solution, maintenance, upgrades and support needs to be guaranteed by the solution provider. Hosting needs to be done on low latency cross connected environment. At Alpha Novae, we were able to provide a solution based on AlphaTrader environment fulfilling their requirements. The set-up is composed of one AlphaTrader Server instance (and so only one Server licence) and several AlphaTrader Clients instances (6 licences to start). Req1: The trading platform needs to allow Spot Forex trading. AlphaTrader is a multi-asset platform allowing trading on Spot Forex (primary historical asset), Futures, Stock, etc. Options are not yet available but will be added in the future. Req2: If possible, account and position must be extracted from the client Prime Broker. 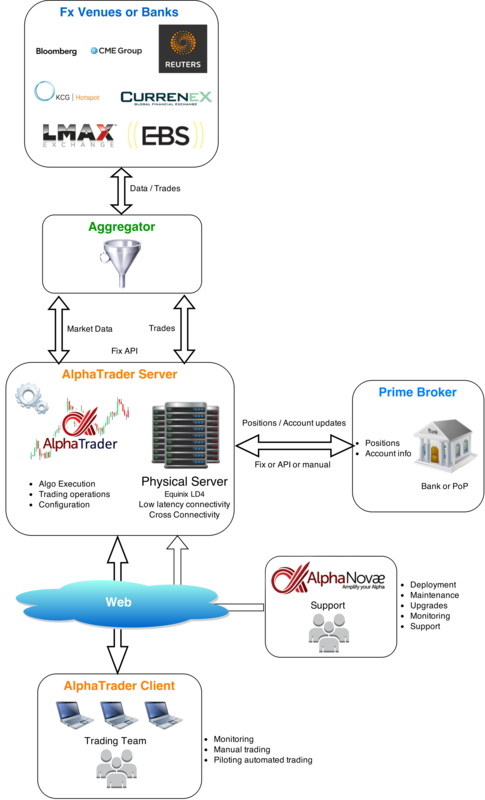 If the Prime Broker of the client provides these information through a Computer to Computer interface (API, FIX, other), AlphaTrader will be able to connect to it and gather positions and account information at Prime Broker. Without connectivity to Prime Broker, AlphaTrader will build the position based on the execution received from the liquidity aggregator without the ability to perform reconciliation and synchronisation. Hence position may not be synchronised with the prime broker, e.g. AlphaTrader starts for the first time with a position of 100 lots existing at prime broker; without connection between the Prime Broker and the platform, AlphaTrader will not be aware about this existing position and will start with a visible position of 0 on EURUSD. Then AlphaTrader will create a position with future executions reports but it will still differ of 100 lots. Positions adjustment will however be possible manually to re synchronise it to the Prime Broker one. Account information (balance, equity, margin, etc.) will not be available at all, if not provided by the Prime Broker. Req3: Manual trading should be possible on the platform. Manual trading is now available on AlphaTrader Server application which will run on the Equinix server. But we are now (Q2 2015) in the process of adding it to the V2 of AlphaTrader Client which is expected to be rolled out on Q3 2015. This will allow manual trading in a multi-user environment. Improvement of the ergonomics aspects, which were put aside on this prototype. Adding manual trading actions to the client. So we are now working on the new and improved version of AlphaTrader Client. Each trader will have an instance of AlphaTrader Client running on its own local computer. Each AlphaTrader Client will connect to AlphaTrader Server running on Equinix LD4. See above architecture diagram of the solution. Req4: Automated trading should be possible on the platform. Automated trading is the main focus of AlphaTrader and is consequently allowed through AlgoNaute module. Strategies are run by AlphaTrader Server to get best proximity to the trading venues. AlphaTrader Client also allows to monitor and to pilot automated trading. Development of strategies is possible in a Visual Studio C# environment using the AlphaAPI. Req5: The solution should accommodate a multi-traders environment, allowing scalability. Thanks to AlphaTrader Client it is possible to get several users working in parallel. Each user run AlphaTrader Client on his own local computer. Scalability is possible by design. Req6: The liquidity provider connectivity needs to be scalable with aggregation functionality. The client having a Prime Broker account, it is possible to use the forex liquidity aggregator we are currently integrating. Expected end Q2 2015. Cf our connectivity page. Once you have a business relation set-up with a new liquidity provider, adding them in your aggregation is just a matter of configuration. No need to go through a new long development and integration process. More information will be available soon. Contact-us if interested. Req7: Deployment, maintenance, upgrades and support needs to be guaranteed by the solution provider. This is possible through our gold support package. Req8: Hosting needs to be done on low latency cross connected environment. Hosting is not provided by the gold support package. But it is possible to be hosted in a low latency cross connected environment on an Equinix rack. The client chose to be hosted on Equinix LD4 which is an ideal location to be collocated to the London liquidity providers, and get direct access to the other Equinix datacenters around the globe. The cross connectivity with all liquidity providers whatever their location makes it perfect for high frequency trading or any latency sensitive trading. So the choice of AlphaTrader trading environment and our Gold Support package was natural. The client gave us the green light and the project is on progress.